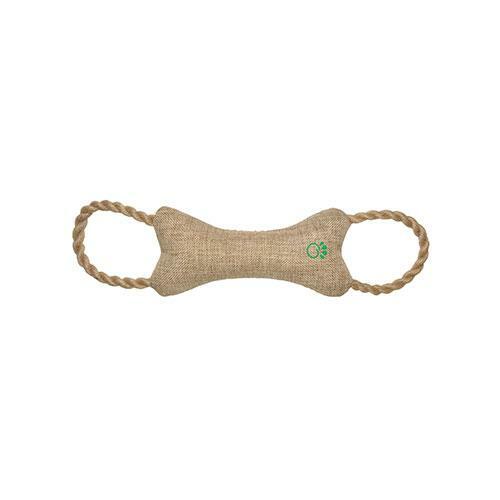 Dogs of all shapes and sizes need daily exercise and this all-natural Jute Dog Toy by GF Pet offers hours of fun and play to engage you and your dog! It's constructed of an eco-friendly vegetable fiber called jute blended with cotton. In addition to being soft and pliable, it's also durable so that your dog can't destroy it. There's a built-in squeaker device that keeps your dog entertained by himself if you're not tugging at the other end of this rope bone. It's also easy to keep clean by throwing it into the washing machine on a regular basis. • Constructed of environmentally friendly natural jute and cotton. • Easy to clean with machine washing. • Makes a convenient tug toy. • Squeaking sound encourages fun and play.